That everyone has the right to seek the truth and meaning for themselves, and that the best setting for this is a community that welcomes you for what you are - beliefs, doubts, questions and all. We see faith as something personal, developing and changing as we mature and acquire knowledge and experience. 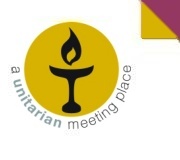 The Unitarian Church provides a supportive religious environment, but does not preach any dogma, nor does it attempt to exercise any institutional authority over anyone's life. Why are we called Unitarians? Our forebears were Protestant Dissenters who emphasized the oneness of God, and 'divine unity' as opposed to Trinitarian beliefs. As a result we were described as 'Unitarians', initially as a term of abuse. Today we affirm the essential unity of humankind and of creation. We do not claim the right to define God for others, nor do we expect anyone to accept uncritically anything they hear. We recognize that God is experienced and defined in many ways. For some people the very word 'God' is unhelpful. How do we find unity? We find unity in shared values: mutual respect and goodwill in personal relations; the use of reason and honest doubt in the search for truth; constructive tolerance and openness towards the sincerely held beliefs of others; reverence for the earth and the whole natural system of which we are part; peace, compassion, justice and democracy in human affairs. On our religious journey we may be inspired by our heritage in the Judaeo-Christian tradition (pre-eminently the life and teachings of Jesus); traditions of critical philosophical thoughts; the example and spiritual insights of others; sacred writings from all faith traditions; the creative work of writers, artists and scientists; and our own experience of life.